Embracing the Future of Grocery and Food Shopping in Washing D.C.
I’m sorry if I mislead you but the future is here and it is happening this very moment. Have you heard of Mercato? It is an online platform that is connected with major grocery stores within Washington D.C. like The District Fishwife, Puddin’, Harvey’s Market or Cucina Al Volo. Those are just some of the stores you can pick from; the list is much longer than that. Mercato is just an example of the emerging online platforms that are transforming grocery shopping. Let’s have a closer look at a few more online platforms that are revolutionizing food delivery and grocery shopping, and what this means for those in Washington D.C.
First, here is more about Mercato and Washington D.C. grocery delivery. You can access the service through their website, mercato.com and identify the store you want to acquire your groceries from; next, place your order and they will have it delivered to your location within an hour. Furthermore, you can even place orders a month in advance or even have them deliver groceries to your home at intervals. How convenient is that? All you have to do is determine when you run out of particular items and just let them deliver them to you before you run out. That way, you will never have to worry about grocery shopping unless either you want to have them stop delivering something or you want to request they add a new item to the mix. What about UberEAT? If it sounds something like Uber or it crossed your mind that it might be related to Uber, you are right. UberEAT is a service from Uber that is just like Uber with the difference being that it is for delivering food rather than transporting people. The service is connected to various major restaurants across the globe and the same is true here in Washington D.C. All you have to do is identify where you want to order from, place your order, and according to UberEAT, you will receive your well prepared and really for consumption meal within 30 minutes. 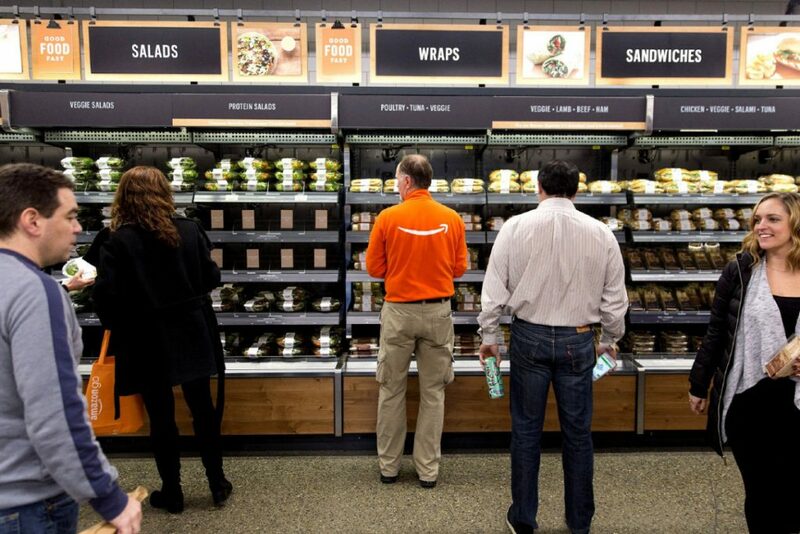 Earlier this year (2018), Amazon opened its revolutionary project, Amazon Go to the public. It is an automated grocery store with AI (Artificial Intelligence), and it makes use of sensors and cameras to monitor and record customer activities. The store has no cashiers and you are not required to check out of the store because the AI system handles all these tasks. All you need is a registered Amazon Go app on your Android or iPhone device. Once in the store, you should only have your device scanned and you are free to do shopping as you please. The AI system takes note of what customers have picked, and bills it accordingly. Walk in, and walk out; that is what the theme of the store is. Furthermore, Amazon has been preparing its drones for food delivery among other deliveries. The name of the project is Amazon Prime Air. The only problem has been the law, which has issues with the usage of drones to some extent; for instance, how safe the drones are, where they should fly, air traffic, landing zones, and things like that. Once things are cleared, drones will add to the revolution of grocery shopping as well as food shopping. I bet you will agree that drones will be more efficient for delivering pizza compared to the pizza delivery guy? This is what we have come to and things will just get better with time. These online platforms are paving the way for even more advanced features in the future. Having groceries and food delivered right to your doorstep is convenient in many ways. It saves time since you do not have to go out to buy the food by yourself. It saves you money, especially in cases where you have to drive to the food or grocery joint. I think the most amazing thing about it, particularly with grocery shopping, is that it can be automated. Enterprises like Amazon, Mercato, and UberEAT are just paving the way for even more convenient technologies for food delivery systems. It is possible that in the future, there are those who will not know that people used to go to physical grocery stores because they will be living in a world where all grocery shopping is done online. It may be far-fetched; nevertheless, virtual reality was once virtual, but today it is a reality!